Hope you're caught up on Transformers: Prime Season 2, because spoilers are incoming. Today I reviewed Breakdown, who's A) one of the cartoon's major villains, and 2) not for sale in North America. That particular combo has meant that the prices are climbing ever higher on the secondary/import market, but there is an alternative out there, if you don't mind a figure that's a little more story-specific, and a little less screen-accurate. As you know, Prime is not above killing off characters, and that applies just as much for the villains as it does for the Autobots. Breakdown seems to be the one to take the brunt of the abuse on the Decepticons' side. In Season 1, he had his eye ripped out by scientists working for the sinister M.E.C.H. organization; in Season 2, he and Dreadwing were assigned to kill Airachnid, but she got the better of him and killed him instead. His remains were found by M.E.C.H., who began experimenting on the body. This figure is basically identical to the previous release, just done in black instead of blue. The color didn't change as much on the show - he was still blue, but he was dirty and dusty. You know the sort of "dirty" paint washes some customizers like to put on the movie toys in the name of "realism?" It was like that. You still apply stickers to create his details, but some of the things that were stickers last time are paint apps now. After being reassembled by MECH, Breakdown's body was cracked and scarred, and the head has been resculpted to reflect that. His right eye has been replaced, but there's no face around it - just a big hole. There are scratches on the other side of his face, the points on his head are broken off, and in general this is just a rougher take on the same design. The head isn't the only change on this figure. 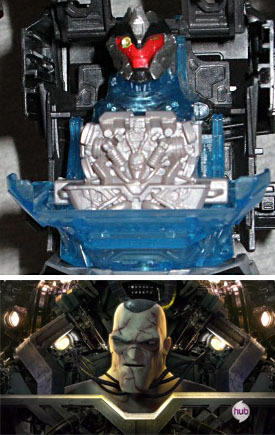 In the Season 2 episode "Nemesis Prime," MECH used what they had learned from Breakdown's body to create a duplicate of Optimus Prime in order to sow confusion. A fight with the real Optimus lead to the fake's destruction, when it fell through the roof of a chamber and onto the man who was remotely "driving" it, MECH's commander Silas. Silas was nearly killed, but the MECH scientists wired him into Breakdown's body as a form of emergency life support. When he awoke, Silas dubbed himself a Cybernetic Life Augmented by Symbiosis - or "C.Y.L.A.S." Cute. Then he joined the Decepticons for some revenge. When you open up the chest on this figure, you'll find a new chunk of plastic molded to show Silas' head surrounded by internal machinery. It's unpainted gray plastic, so if you don't know what you're looking for it's hard to tell what's what, but the sculpt is based directly on what was seen in the cartoon. The panel is only glued in, and can be removed - it will fit into the chest of the blue Breakdown (since the molds are the same), but that figure's chest won't close with it in place. The reason the chest won't close is another one of the remolded parts: instead of a simple bumper, this Breakdown has a large vac-metallized brush guard on the front of the truck. It doesn't fold away into the chest when he converts to a robot (despite still being hinged), instead acting as bodyarmor and adding three more 5mm holes to the front of the vehicle mode. 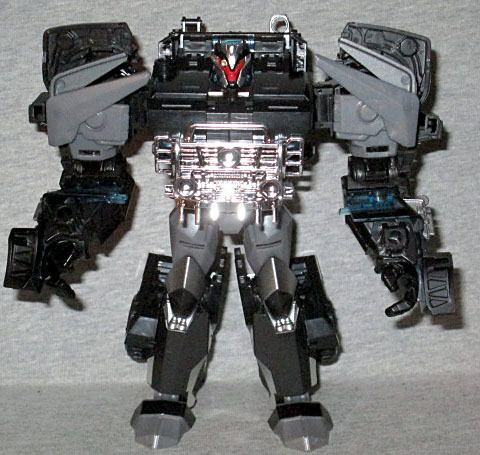 The truck is black with blue glass, and in addition to all the stickers the last release had, this one also has 11 "crack" stickers to make him look damaged, and a few MECH logos if you don't want him to be a Decepticon. As a Japanese release, Silas Breakdown comes with an Arms Micron partner. 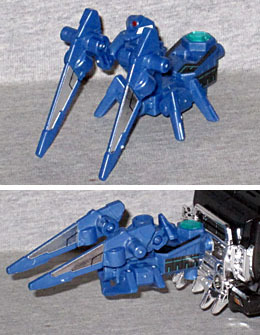 His Mini-Con is Magi, a robotic preying mantis that turns into a double-bladed weapon of some sort. Magi definitely isn't as cool as Zamu is, and works better in animal mode than as a weapon. There are lots of 5mm ports and pegs all over him, so at least you'll be able to combine him into lots of gigantic, stupid, super-weapons. Clearly the reason Takara made this figure black was to help differentiate it from the normal Breakdown release - if they'd gone with "slightly darker blue" the toy wouldn't have stood out on shelves, and people who bought the original would have felt ripped off. If you want a Breakdown but don't want to pay for the blue one, Silas is a more affordable option. 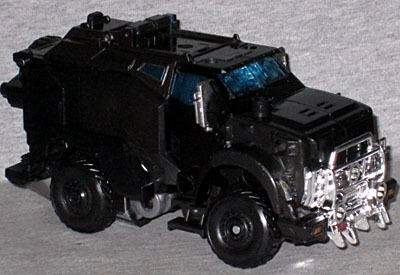 This entry was posted in addendums, blog exclusive review and tagged Transformers. Bookmark the permalink. "Silas was nearly killed, but the MECH scientists wired him into Bulkhead's body as a form of emergency life support." It was Breakdown, not Bulkhead. Just a small typo I spotted.